'Goosebumps' is synonymous with creepy fun and IDW's 'Goosebumps: Download and Die' is no exception. Besides the usual pitfalls of high school life a mysterious new cell phone with all the latest technology is more than Mitra could bargain for. Mitra's new school year is full of promise and excitement but when a new student inadvertently comes between her and best friend Kyra, feelings begin to hurt. Compounding the situation is a band of jerky boys who bully and camp out at the computer lab making it hard for her to finish her assignment. On top of all that, Mitra's brother is a hall monitor who takes himself way too seriously. The year is off to a rough start but when a mysterious package containing a state-of-the-art cell phone begins to help change Mitra's luck things start to turn around. It's more than a coincidence as the phone seems to know what Mitra is thinking and feeling. It seems to have become sentient but at what cost? Jen Vaughn establishes the trio's friendship quickly with great dialogue and camaraderie. Even Mitra's jealousy is validated but never seems intentional or with malice. It does, however, motivate Mitra's actions once she gets the new phone. Things just get weirder from there and we wouldn't want it any other way. I've been a fan of Michelle Wong's art since her run on Action Lab's 'Tomboy.' Her clean lines, well-paced, well-designed layouts set the mood and hit the right notes at the right times. Especially in a story like this where perfectly timed reveals require patience and the proper build-up. Wong's details from mimicking how social media appears on the phone to the gameplay of video games are fresh and appealing with a sense of fun and wonder amid the eerie cloud that hangs over them. Triona Tree Farrell's colors are vitally important in making the transitions from normal situations to heightened tension with a surprisingly menacing shade of pink. 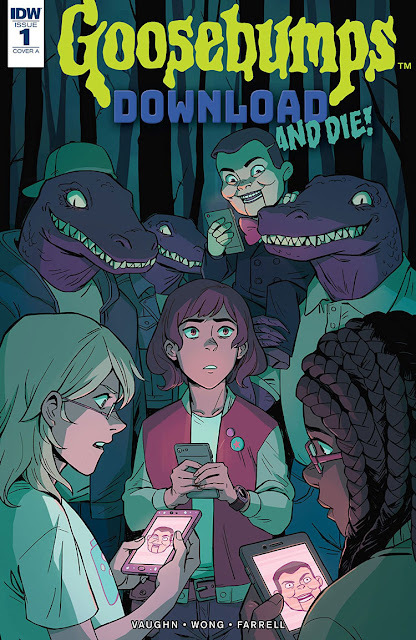 This arc of 'Goosebumps: Download and Die' begins with a fun new journey that ratchets up the creepiness by the end of the issue making it an all-ages version of 'Black Mirror.' It's entertaining, engaging, and of course a little sinister.